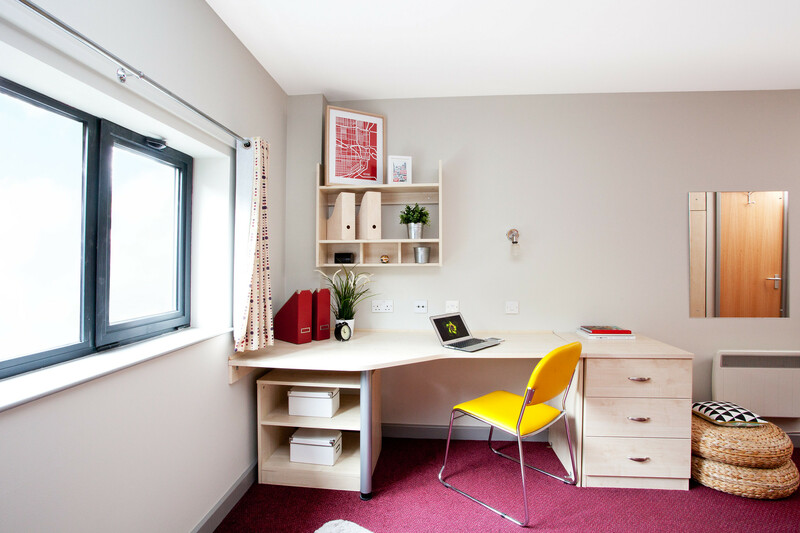 Next door to our Marketgate accommodation you’ll find Phoenix Court – a brilliant option for students who prefer to live in the centre of the city. Offering en-suite rooms with the benefit of living right opposite Cabot Circus with over 120 shops and restaurants, and a cinema, on your doorstep. The lively Stokes Croft district is a short walk, and Frenchay Campus is easy to get to by bus. Managed by our partners Unite Students, Phoenix Court is open to both City Campus and Frenchay Campus students. Three-quarter beds with ensuite shower room, wardrobe, desk and desk chair, under bed storage and bedside cabinet. CCTV, on-site support, 24/7 emergency contact centre, common room with table tennis, pool table, access to Marketgate common room, TV and sofa area, vending machines, free MyUnite app to log maintenance requests. Who does what You apply to Phoenix Court through the University and we allocate the rooms. Unite Students then issues your tenancy agreement and manages the residence. Phoenix Court, Bond Street South, Old Market, Bristol, BS1 3PH. If you'd like to make Phoenix Court your new home, find out how and when to apply. Received an offer of accommodation for Phoenix Court or want more info?